Last week this image - by an artist called Bouvette - appeared on Facebook. It immediately reminded me of stories of our first sisters. At the end of a long, hard day in the school they would gather with their sewing, round fire and candlelight, and share their vocation stories, their hopes and dreams, longings and aspirations. Dreams of doing great things for God or of becoming a missionary in faraway countries were expressed, flagging hearts were lifted, and their mutual love and support were strengthened. Our Cor Unum - as essential to us now as it was then - was effectively forged around that candle. 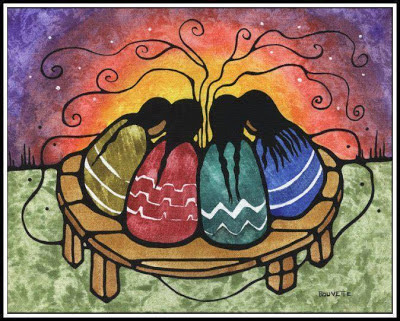 All of which makes the caption to the image (unattributed, but maybe also by the artist) so very appropriate - We must gather in the warmth of the Heart, where all beings are equal and sacred, the place where duality ends and Love begins. All great things are accomplished in the Heart. And all of this is especially appropriate for today, when the Society celebrates the anniversary of the day our foundress and her first companions made their first vowed commitment to God in the fledgling congregation. That day, two hundred and twelve years ago, is regarded as the Society's birth, and so today is our 212th birthday! Happy Feast - and happy birthday to us all!